Drum style: A pipe brings water directly to a reservoir (a pan) attached to the furnace. The level of water in the pan is controlled by a float valve, similar to a small toilet tank float. The wick is typically a foam pad mounted on a drum and attached to a small motor; hot air enters the drum at one end and is forced to leave through the sides of the drum. When the hygrostat calls for humidity, the motor is turned on causing the drum to rotate slowly through the pan of water and preventing the foam pad from drying out. 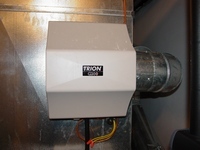 For the latter reason especially, drum-style humidifiers should always be turned off at the water supply during summer (air conditioning) months, and should always be used with high quality furnace air filters (MERV ratings as high as possible to ensure small numbers of mold spores reaching the humidifier's pan) when the water supply is turned on. Disc Wheel Style: Very similar in design to the drum style humidifiers, this type of furnace humidifier replaces the foam drum with a number of plastic discs with small grooves on both sides. This allows for a very large evaporative surface area, without requiring a great deal of space. Unlike the drum style humidifiers, the disc wheel does not need replacing. Flow-Through Style (also known as "biscuit style" or many other, similar variant names): A pipe brings water directly to an electrically-controlled valve at the top of the humidifier. Air passes through an aluminum "biscuit" (often called a pad; using the term "biscuit" to emphasize the solid rather than foamy form) which is similar to a piece of extremely coarse steel wool. The biscuit has a coating of a matte ceramic, resulting in an extremely large surface area within a small space. When the hygrostat calls for humidity, the valve is opened and causes a spray of water onto the biscuit. Hot air is passed through the biscuit, causing the water to evaporate from the pad and be carried into the building. I am planning to install a bypass humidifier onto my furnace duct work before next winter. It requires a drain hose because it has excess water flow. I am thinking on running it into the condensate drain from the A/C unit. See photo. The cap on the top of the Tee just lifts off (for clean out I'm sure). When I take the cap off, air blows out the top. If I stick the humidifier drain hose down into the top of the tee, do I need to seal (not permanently) it off with something? Put a short piece of PVC pipe in the top of the tee, and then put the drain hose for the humidifier in it. You don't want the humidifier's drain hose sticking past the tee where the A/C line is. It can clog easier if it does. It is best if you seal around the hose then. But if its in a conditioned space, it doesn't need to be sealed. After a lot of years bacteria builds up in the furnace drain line and it can slow down. Especially if it is a soft hose. That is why we have to remove and flush the condensate trap on some brands. Don't want to create your own problem. If you can keep them separate that is better but combining them happens a lot too. What you don't want is the AC draining in higher than the furnace on the same pipe. 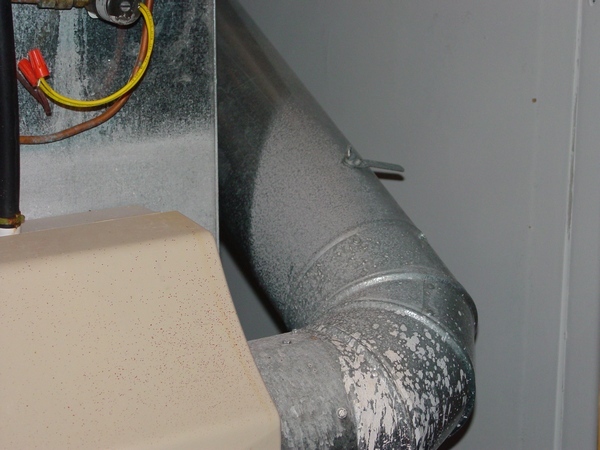 If the drain plugs after the furnace then the AC can fill up the furnace heat exchanger with water and damage it. We always tee in the AC to the side of the furnace if it is using the same pipe and leave a open tee so it can spill out. If you have a Flow-Through Style humidifier as I do you may also save some energy and money! When someone is telling you that you can save energy by sealing your ductwork picture a Flow-Through humidifier as a 6” pipe directly connected from the plenum to the cold air return duct. In other words, you have two big 6” holes in the supply and return connected together. That means that pretty big part of the airflow do not participate in the conditioning of your house but just coming back to the furnace. Of course, it helps to heat up the return air, but because it is stealing air from the living area, it increases the furnace cycle! However, what can you do? You need that humidifier running! Of course, you do, but only when outside temperature is below 32 degrees F! 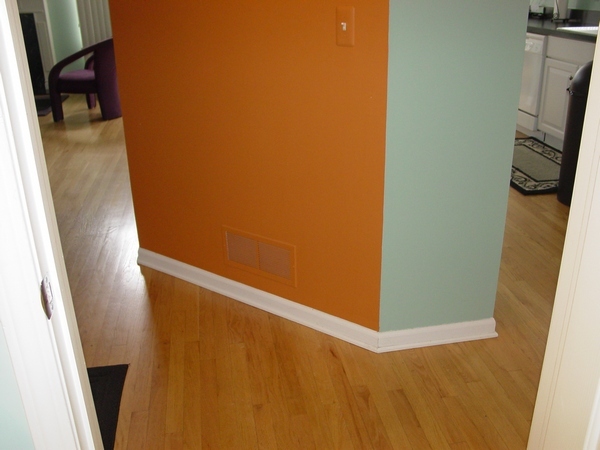 It is OK if humidity in your house is hovering around 40%, if you have hardwood floor - 40% - 50%. Buy a humidity meter and shut the humidifier off when the inside humidity is high enough. In the summertime I am not only turn the damper off, I even put a piece of cardboard to block off the pad. If you would like to read more, please use the “BuyNow” button below and you will gain an in instant access to the seventh chapter of my Energy Saving Book book dedicated to the energy conservation issues! In the chapter, you will learn how to save energy by using your humidifier the right way, how to install a humidifier by yourself and save on installation, or how to add the second one if you do not have enough humidity in your house. The chapter has 8 pages and 19 pictures in it. Price of the chapter is only $2.50. Please read more on this page.